The titles of Chris Kimball ’73’s published books, The New Best Recipe and More Best Recipes, quite literally reflect his convictions about cooking. Kimball believes that there is an absolute best way to cook anything and everything — and furthermore, that with the right recipes, anyone can be a great cook. Kimball’s passion for well-made food (and his zeal for didactic details in recipes) is reflected in the magazines, television shows and books that he oversees as the head of the America’s Test Kitchen empire (www.americastestkitchentv.com), based in Boston. His official title is founder of Boston Common Press, the company that owns the various media that come out of America’s Test Kitchen. In reality, Kimball is much more than just the founder, serving as hands-on leader and cooking guru/taskmaster to more than three dozen employees who create hundreds of recipes each year. 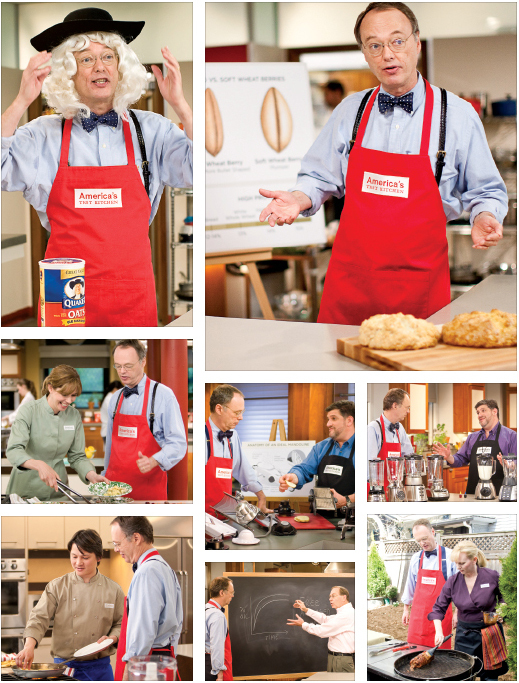 And to the public, Kimball, sporting a natty bow tie and his signature red apron, is instantly recognizable as the face and voice of the America’s Test Kitchen brand. The brand began with a small, unassuming food magazine, Cook’s Illustrated (www.cooksillustrated.com), which in terms of circulation is now one of the biggest cooking magazines in the country and is edited by Kimball. It has grown to include a spin-off magazine, Cook’s Country (www.cookscountry.com); two shows on PBS, America’s Test Kitchen and Cook’s Country (www.cookscountrytv.com), both hosted by Kimball; a new radio show debuting this fall, also hosted by Kimball; a bevy of cookbooks each year; and four successful websites. The company is privately held and revenues are not publicly disclosed, but the Boston Globe has estimated the gross revenue for print and web subscriptions alone at more than $40 million a year — and that’s not counting television, radio or book revenues. Fusing science, analytical testing and commonsense tasting, Kimball and his team have developed an approach to cooking that is quite different from the celebrity chef phenomenon. Though Kimball is featured as the face of America’s Test Kitchen and Cook’s Illustrated, he and his team try to shift the emphasis to where they think it belongs: the food. Kimball is involved in every television and radio episode, sits in on meetings for all the books and magazines, and tastes everything in Cook’s Illustrated. His workday starts at 6:30 a.m., and the editorial director at Cook’s Illustrated, Jack Bishop, says with a laugh, “When Chris arrives on his motorcycle, wearing his bow tie, it is a sight to be seen.” Kimball’s contrast of practical neckwear (chosen for his ability to keep it out of the food he cooks) and daring transport might seem unusual, but above all, Kimball’s approach to life is about how to find the best, most enjoyable way to live it. It’s a philosophy that’s reflected in Kimball’s fondness for simple, unpretentious food, as well as in his personal passions, which include driving fast, gorgeous cars (“Driving with Chris in his Maserati in Boston is a death wish,” says Bishop, who says that once was enough for him) and the Grateful Dead (Kimball plays in a Grateful Dead cover band). Majoring in primitive art, Kimball recalls having excellent art history professors and cites Professor Albert Goldman’s classes as being particularly memorable, but he acknowledges that he probably learned as much outside the classroom as inside. During his undergraduate years, Kimball drove a cab on weekends and remembers sitting on the roof of the student center during a protest, talking a fellow protester out of throwing a Molotov cocktail. After a couple of jobs in publishing and marketing, Kimball, who had always had an interest in cooking, began taking cooking classes. Frustrated with the lack of answers about why some recipes worked and others failed, Kimball decided to start his own cooking magazine in 1980 and raised $100,000 from friends and family to get it going. “The other food magazines weren’t really about food,” he says. “They were about restaurants and lifestyle.” This first magazine, titled Cook’s, already bore Kimball’s soon-to-be signature emphasis on cooking. Eventually, the magazine was sold and operated by different media companies before being closed down by Condé Nast in 1990. In 1993, Kimball decided to try again, and this time, after buying back the name Cook’s, he ditched the advertisers as well as any lifestyle and travel articles requested by said advertisers. The result was Cook’s Illustrated, an advertising-free publication that is a cross between Consumer Reports and a high-end neighborhood recipe pamphlet. The magazine only has color on the cover; inside, unfussy black-and-white photos are augmented with precise line drawings. In 2000, Kimball started America’s Test Kitchen, now airing its 10th season on PBS. “It’s no secret that in the food world, you need to be on TV,” says Kimball. “If you’re not, it’s very difficult.” Unlike traditional cooking shows, which are built around the personality of the chef-host (think Julia Child), America’s Test Kitchen is much closer to a classroom. Kimball rarely, if ever, cooks on the show, leaving that to the test kitchen staff. He acts in his host role as a stand-in for the viewer, asking the reasoning behind each ingredient and technique. The featured recipes are rarely fancy; the emphasis is always on simple, easy-to-find ingredients transformed into tasty, approachable food. Kimball believes that everyone can agree on the best version of a dish. “This whole idea of taste being relative — when it comes to basic American cooking — is just not true. I mean, there are good mashed potatoes and bad mashed potatoes, and it’s not that hard to tell the difference,” he says. The resulting recipes are impressive. Cook’s Illustrated’s recipe for pie dough, which uses vodka to create a flaky crust, is hailed by Kimball as one of the magazine’s best discoveries and immediately became a classic among bakers. Of course, with access to so many test kitchens and sample recipes, the question becomes whether Kimball cooks at home. The short answer, at least during the week, is no. That task falls to his wife, whom Kimball met when she was working at a summer job at a marketing seminar company, where Kimball also worked. Adrienne laughs when recalling how Kimball, who used to have to walk by her cubicle when leaving, would never say goodbye until one evening when she yelled out “Good night, Chris!” Adrienne, who has been married to Kimball since 1987, worked on the business side of Cook’s before leaving to take care of the family’s farm in Vermont, their children and their daily lives in Boston. Avoid using a nonstick skillet to brown the butter; the dark color of the nonstick coating makes it difficult to gauge when the butter is browned. Use fresh, moist brown sugar instead of hardened brown sugar, which will make the cookies dry. This recipe works with light brown sugar, but the cookies will be less full-flavored. 1. Adjust oven rack to middle position and heat oven to 375 degrees. Line 2 large (18- by 12-inch) baking sheets with parchment paper. Whisk flour and baking soda together in medium bowl; set aside. 2. Heat 10 tablespoons butter in 10-inch skillet over medium-high heat until melted, about 2 minutes. Continue cooking, swirling pan constantly until butter is dark golden brown and has nutty aroma, 1 to 3 minutes. Remove skillet from heat and, using heatproof spatula, transfer browned butter to large heatproof bowl. Stir remaining 4 tablespoons butter into hot butter until completely melted. 3. Add both sugars, salt and vanilla to bowl with butter and whisk until fully incorporated. Add egg and yolk and whisk until mixture is smooth with no sugar lumps remaining, about 30 seconds. Let mixture stand 3 minutes, then whisk for 30 seconds. Repeat process of resting and whisking 2 more times until mixture is thick, smooth, and shiny. Using rubber spatula or wooden spoon, stir in flour mixture until just combined, about 1 minute. Stir in chocolate chips and nuts (if using), giving dough final stir to ensure no flour pockets remain. 5. Bake cookies 1 tray at a time until cookies are golden brown and still puffy, and edges have begun to set but centers are still soft, 10 to 14 minutes, rotating baking sheet halfway through baking. Transfer baking sheet to wire rack; cool cookies completely before serving. Chris Kimball ’73 offers guidelines to help you become a better home cook. Use more salt. People don’t use enough salt, which is ridiculous. The amount of salt you consume when you cook is a small fraction of your daily total salt intake, because it’s all in the processed foods. Use more heat. People don’t use enough heat. People are scared of heat, but heat creates flavor. When they sauté, they crowd the pan and they don’t preheat it properly, and they end up steaming the food. When you go to professional kitchens, you see a lot of heat, a lot of smoke. Taste before serving. People don’t taste the food before they serve it, so they don’t adjust the seasonings, and they end up with something that would be improved by a little more salt, a little more fresh herbs, a little more of this or a little more of that. That last-minute adjustment of the dish, assuming it’s something you can adjust, is something that makes a huge difference. Use sharp knives. People don’t have a sharp knife. (Sharpening steels don’t sharpen; they tune up the knife. To sharpen, you have to regrind the blade.) So people have incredibly dull knives, which means they’re likely to cut themselves. It’s incredibly hard to cook with dull knives. Check your oven temperature. Buy a $13 oven thermometer, heat the oven for 20 minutes, put in the thermometer and check it. Often, the oven is off by at least 25 degrees. We calibrate our ovens every 30 days. That’s what people at home don’t realize. They set their oven to 350, and they don’t realize it could be 375 or 400. It could be anything. That’s why cooking times are never to be trusted. No one’s ever cooking under the same conditions. Compared to the other cooking magazines, which are supported by advertising, a subscription to Cook’s Illustrated is expensive, $24.95 for six issues. After Kimball placed a notice in The New York Times announcing Cook’s Illustrated’s return, 1,500 subscribers, many of them former Cook’s readers, immediately signed up, and today, almost two decades later, the magazine has a million subscribers, a number on par with glossies such as Bon Appétit and significantly higher than competitor Saveur, which has about 270,000 paid subscribers. Cooksillustrated.com is unusual in that none of its content is free, even with a subscription to the magazine. A year’s subscription to the website costs $34.95. In a media world that is rapidly changing and during a recession where many publications’ advertising revenue has shrunk dramatically, Kimball also stands out because his magazines and website all are free of advertising, supported only by subscription fees. “Considering what a traditional niche Chris is in, he’s been a real innovator, and his models have implications that go beyond his amazing franchise,” says David Carr, media critic for The New York Times. And with his gimlet eye, finicky palate and multimedia reach, Kimball wants his recipes to be the ultimate stand-in between the ingredients and the home cook. America’s Test Kitchen may be a democracy of recipe testers, but one very determined ruler stands above it all. View highlights of Chris Kimball ’73 on America’s Test Kitchen. Claire Lui ’00 is a freelance writer and editor. Her articles have appeared in Print, American Heritage and other magazines and websites.